Two firsts occurred this past holiday week: Wally learned to crawl and Jay learned that a little brother means more than kisses and hugs. Late on Christmas morning Jay sat in the shadow of the Christmas tree raking a plastic saw across the top of his new Black & Decker toolbox, as Wally used his elbows to drag himself across the wrapping paper-littered floor towards the newest object of his big brother’s affection. Jay was so wrapped up in his project (“I’m fixing this because it’s broken,” he said to himself, now rapping away with his hammer) that he didn’t see Wally approaching. Wally grabbed Jay’s toolbox. “No Wally!” Jay said in an aggrieved, high-pitched voice. He yanked the toolbox out of Wally’s hand and carried it across the room. Wally watched him go and, perhaps concluding that it wasn’t worth the 10-minute trek to try again, rolled over on his back. It’s been exciting to watch Wally learn to crawl (something Jay never did) but also a little heart breaking to see him developing aspirations and desires that are bound to be thwarted so much of the time. Caroline and I have begun trotting out the line “all toys are for sharing” but there’s only so much we can do (or maybe even should do) to level the inequality between Jay and Wally. If there’s any consolation for Wally, it’s that embedded in Jay’s complaint—“No, Wally!”—was newfound respect for his little brother: no longer just a cuddly plaything, now a legitimate threat. We spent Christmas at my dad’s house in rural Cobleskill, upstate New York, about 40 miles west of Albany. He lives on 100 acres of fallow farmland, in an old white farmhouse that was cobbled together over the course of a century by the Shuart family, who owned it for generations until 2001 when the family patriarch decided he’d had it with cows and decided to move to Florida instead. But it didn’t, and as was the story at Thanksgiving, all my anxiety about the trip proved to be unfounded (save for three harrowing hours in Beltway gridlock on a post-Christmas trip to see Caroline’s parents during which I basically lost my mind). Over the last five years Christmas rituals in my family have been in flux. The main change has been the guest list. In that time my sister, brother, and I have all gotten married, bringing new (and wonderful) people into the family, but also of course necessitating that every other year we spend Christmas apart. And even more recently there have been the babies—three in all now, counting my sister’s son Peter—who make an outsized mark everywhere they go. The biggest change, though, was a negative one. In November 2006 my mom died suddenly. Only a few weeks after her death we gathered in the living room of our house in Maine to open Christmas presents. The sense of loss was overwhelming that morning, and that same feeling dominated our holiday gatherings in the years afterward. Whenever we’d get together for Easter, or Christmas, or Thanksgiving, the most powerful feeling around the table was that something was missing; and that missing thing had the effect of casting all the rest of us into uncertain relationships with each other, like disjointed pieces of a former whole. The first time I remember ever thinking I wanted to have kids was two days after my mom’s death. It was at night in my childhood bedroom in Maine just before I went to sleep. Caroline and I weren’t even married at the time (we’d get engaged eight months later), but in a moment I was struck by the thought that the only way to respond to such a tremendous loss was to create new life. Five years later I can say that there’s no plan I’ve ever pulled off better. Late on Christmas Day I was sitting on the couch in my dad’s living room. My sister was dozing underneath a blanket by the woodstove. Wally was bouncing on his grandfather’s lap. Caroline and a few others were playing Settlers of Catan on the kitchen table, dice clattering across the table every few minutes. Beside them, Jay was playing the “train game” with his Great Aunt Cat, where she was the conductor and he was the engineer, and they picked up and delivered packages, used Jay’s new tools to perform engine maintenance, and shooed deer (played by the two dogs padding around the house) off the tracks. As I sat on the couch absorbing the activity around me I realized that for the first time since my mom died Christmas felt the way I remember it feeling when I was a kid: a full and lively house, everyone in their right places, a momentary sense that everything I needed in the world was under one roof. This is partly due to the way the acute feeling of loss ebbs over time, and by the light and energy Jay and Wally have brought into our lives. But the feeling of completeness I had this Christmas also owes to something subtler. As I watched Jay over the few days we were all together I saw how completely enthralled he was to be surrounded by so many people and so much activity. In his eyes there’s nothing incomplete at all about the family he’s been brought into and helped create. It’s a perspective that’s infectious. This entry was posted in Stories & Reflections and tagged celebrating together, family christmas, mom's death, moving on after death by Kevin Hartnett. Bookmark the permalink. Kevin, this was a great read. I completely know what you’re feeling here. 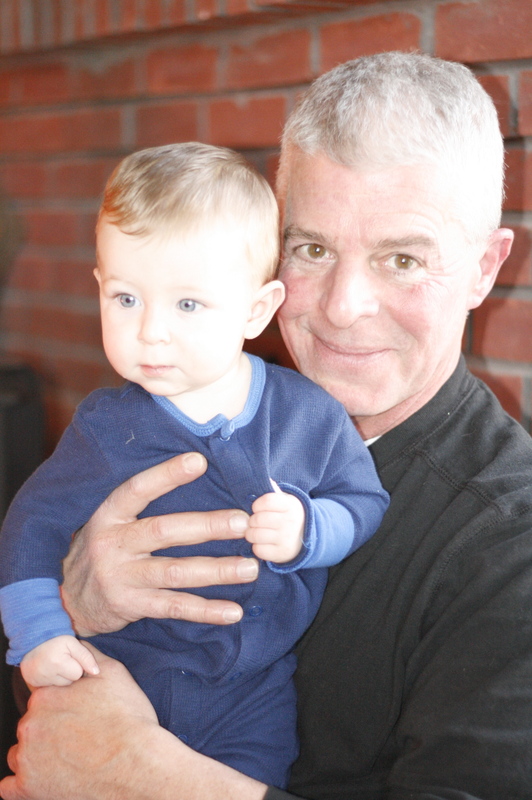 With the passing of our Lo Presti cousin Ben Hanks this past fall, the holidays were difficult for all. We missed you and the cousins’s and families this year at Thanksgiving. Somehow another organized visit is in order. 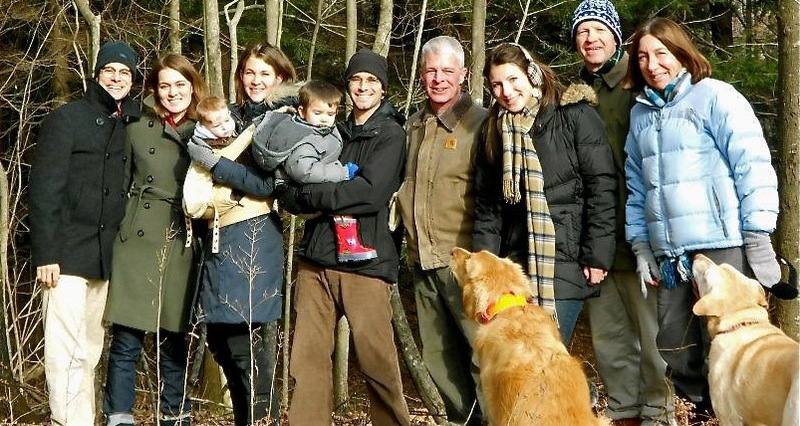 Happy 2012 from Connecticut! I was really looking forward to this post because I was curious about how your Christmas was! This post was one of your best, and that’s saying a lot! Thanks, Anne! I hope you and your family had a wonderful holiday season. Best wishes for 2012. Thank you for this wonderful post! I know the feeling of “faint dread.” As the long Christmas weekend drew near I kept questioning my own judgement. What was it that made me think hosting 15 people (plus dogs and cats) for several days at Christmas – 11 of them staying under this roof – was a good idea? I considered calling the entire thing off. But it was wonderful! The only diificult part was watching family members leave. I often think of your family and your Mom. I am glad to hear that you are finding a sense of whole and peace. Although we would all wish that your Mom was here on earth, I know that she is with all of you. She loves the way your family is growing. And she loves you always.